The best way to get to know a community is by scheduling a tour. See the facilities, meet the staff and residents, and get a feel first hand what it's like to live at Assured Assisted Living 6 Assisted Living. A family of care homes dedicated to providing excellent Alzheimer’s and memory care, Assured Assisted Living operates seven care homes in the Castle Rock and Parker region. With a focus on Alzheimer’s, stroke, Parkinson’s and other dementia-related diseases, we offer residents a variety of specialized programs and services that adapt to their ever-changing needs. Each resident receives a personalized care plan that emphasizes their strengths and helps them make each day meaningful. Assured Assisted Living, LLC was founded in 2005, and is owned and operated by wife and husband team Sheryl A. Thompson, RN and John A. Thompson. One major benefit of our homes is the intimate and warm environment that our residents enjoy. Each home offers spacious common areas that are easy to access, and it is here that daily events are often held. Events occur throughout the day, and often include live music, exercise programs, aromatherapy, pet therapy and more. Accommodations are provided in both private and semi-private arrangements, ready to be personalized with an individual’s treasured items. Since we have just a select number of residents at each home and roughly a 1:4 staff-to-resident ratio, seniors receive more attention and interaction with staff members. The size of our homes also helps create a sense of familiarity, so the residents are less likely to feel lost or confused than if they were in a larger community. All accommodations at Assured Assisted Living homes receive regular linen and housekeeping services. When needed, room service for meals is also available. For convenience, we also offer both salon and barber services right within the comfort of our homes. As needed, residents can receive assistance with a variety of daily tasks, including medication management, ambulation, dressing and personal hygiene. To better serve the unique needs of our residents, each caregiver receives training with a specialized curriculum that when completed makes them Certified Memory Impairment Specialists. 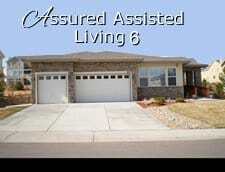 Assured Assisted Living provides seven excellent locations for seniors to receive memory care services and care.